Add rice and water to a small saucepan with a pinch of salt. Bring to a boil, then reduce heat to low and let simmer for approx. 20 min. until cooked through. Set aside and keep warm. Butterfly chicken breast and set aside. Prepare lemongrass by trimming ends and removing outer layers. Cut into small rings. Halve chili and remove seeds, then chop. Mince garlic. Peel and finely slice ginger. Add lemongrass, chili, garlic, ginger, and chicken stock to a large saucepan and bring to a boil. Add coconut milk, some sesame oil, and soy sauce. Season with salt and pepper. Reduce heat to medium, then add chicken breasts to saucepan and let simmer for approx. 5 min. Trim ends of bok choy, then halve. Heat sesame oil in large frying pan over medium-high heat. Sear bok choy for approx. 4 min. Add soy sauce and a ladle of poaching liquid from saucepan and let stew. Right before serving, foam sauce with a hand blender. 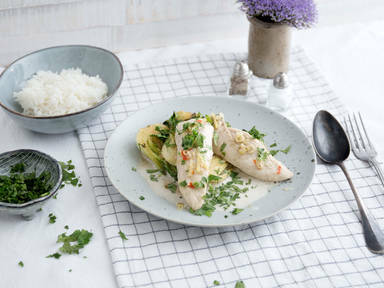 Serve chicken breasts with rice, bok choy, and sauce. Garnish with cilantro. Enjoy!